I just had one thought in response to this post. As a potential donor, another incentive would be for me to connect with a face behind all those charities; I don't do well with logos . . . One of the main reasons behind the success of the Obama campaign is Obama himself. And one of the main liabilities of global warming is the fact that it does not have a human face. Good point.You know, I've been blogging about the Sharing Foundation and telling my personal story about why I care so much - that I forget that there are new people reading this blog who haven't heard me talk or read the hundreds of older posts about the Sharing Foundation. Good reminder to me that there are always new people coming into your network. 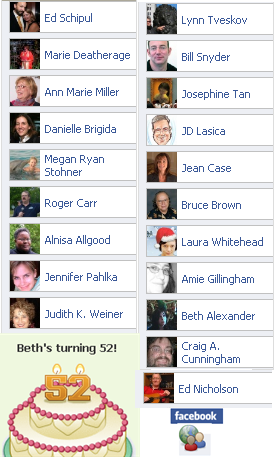 Thanks for sharing, as you always do so well, Beth! I'm celebrating the big 4-0 on March 31 and am thinking about all the different ways to go about it. I'm glad that you've had a good experience with the Birthday Cause feature, and thank you so much for the constructive criticism. There was definitely a glitch in the amount selection page, which we have since fixed. Improving the ability to specify the amount of your target is definitely on our list of things to experiment with. We like the symbolism of having the amount be your age, and think that it adds some extra meaning to the request, but there is definitely a concern about making the ask reasonable and doable. Good luck on the rest of your fundraising, and I hope to see further blog posts about what worked well and what needs improvement. I like the symbolism of asking for dollars for your age, which is fine if you're 20. The application shouldn't make all the decisions for us - let us add a number we want.